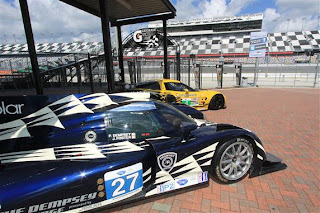 DAYTONA BEACH, Fla. (Sept. 5, 2012) – The most significant development in the history of sports car racing in North America was announced today, with plans for a landmark merger of GRAND-AM Road Racing and the American Le Mans Series (ALMS) unveiled at Daytona International Speedway. Under terms of the merger, the following entities will combine with GRAND-AM: the American Le Mans Series; the International Motor Sports Association, which sanctions ALMS events; the Road Atlanta race track facility in Braselton, Ga.; the Chateau Elan Hotel and Conference Center in Sebring, Fla.; and Sebring International Raceway, via a reassignment of the lease agreement with the Sebring Airport Authority to operate the raceway. Both sanctioning bodies will continue to operate separate schedules in 2013 before racing under one banner in 2014 beginning with North America’s premier sports car race, the 52nd annual Rolex 24 At Daytona. A board of directors has been formed to operate the new combined organization with GRAND-AM founder Jim France as chairman and ALMS founder Don Panoz as vice chairman. Other members: NASCAR Vice Chair/Executive Vice President Lesa France Kennedy, GRAND-AM President/CEO Ed Bennett, ALMS President/CEO Scott Atherton and NASCAR Vice President/Deputy General Counsel Karen Leetzow. "Today’s announcement will transform sports car racing on this continent, along with having world-wide industry implications," said Bennett. "Aside from the organizations involved, everybody wins: drivers, teams, manufacturers, sponsors, tracks – and most all, the fans. "This new approach is going to be revolutionary, as we take the best components from two premium brands, combine them and then benefit mutually from the considerable resources both sides will bring to our efforts. This is a bold move – and the right one – for the long-term, optimum growth of sports car racing." Added Atherton: "This merger will blend the best assets and attributes of each organization in terms of technical rules, officiating, marketing, communications, personnel, scheduling and broadcasting. The result will be one of the strongest, most competitive and powerful motorsports marketing platforms in the world." Post-merger branding still is being determined for the new organization and its principal series, as are specifics regarding the 2014 schedule. Also, the competitive class structure and technical rules beginning in 2014 have yet to be finalized. The ALMS began operations in 1999, with GRAND-AM debuting in 2000. Both organizations were created in the aftermath of the late-’90s departure of the highly popular IMSA Camel GT circuit in North America. IMSA was founded in 1969 by John Bishop and then-NASCAR President Bill France Sr.
"This merger will strengthen professional sports car racing beyond what either of our organizations could have achieved separately," said Panoz. "The American Le Mans Series was founded for the fans and I’m personally gratified that they will benefit greatly as we now work together with GRAND-AM to take this sport to the level at which it belongs in the North American and international motorsports landscapes." France said the merger was exciting both "on a professional and a personal level, with me being a long-time sports car fan. This merger was achieved through a true spirit of cooperation. Moving forward, that same spirit will drive our day-to-day efforts." Collectively, this merger involves a total of eight sports car series racing throughout North America. GRAND-AM sanctions and operates the Rolex Sports Car Series, the Continental Tire Sports Car Challenge and the TOTAL Performance Showcase. GRAND-AM also sanctions the Ferrari Challenge that is operated by Ferrari North America. IMSA is the sanctioning body for the ALMS, the IMSA GT3 Cup Challenge by Yokohama Series, the Cooper Tires Prototype Lites Powered by Mazda Series and the Porsche GT3 Cup Challenge Canada by Michelin. "This looks good from a business standpoint but it also ‘feels good’ from a historical standpoint," Bennett said. "Both GRAND-AM and the ALMS have lineages tied to Daytona Beach, Daytona International Speedway and the France Family. This announcement is a proud moment for all involved, as we now look forward to a bright future for sports car racing." GRAND-AM Road Racing operates and sanctions the GRAND-AM Rolex Sports Car Series, Continental Tire Sports Car Challenge and the TOTAL Performance Showcase. GRAND-AM also sanctions the Ferrari Challenge in North America. Owned by NASCAR Holdings Inc., GRAND-AM is located in Daytona Beach, Florida. With a racing schedule led by the prestigious season-opening Rolex 24 At Daytona, GRAND-AM delivers professional sports car racing to key markets throughout North America in addition to being televised in the United States and Canada on SPEED and distributed globally through ESPN International. For additional information, please visit www.grand-ammedia.com. The American Le Mans Series presented by Tequila Patrón is based on the prestigious 24 Hours of Le Mans. It features multiple classes of purpose-built prototypes and production-based GT cars that race on the same track at the same time. The ALMS holds events annually throughout North America on premier urban street circuits and top permanent natural terrain road courses. The American Le Mans Series has a leadership role in motorsports for the furthering of alternative fuel technology and use. The ALMS was the first motorsports body in the world to embrace an entire suite of alternative energy sources – E10 and E85 cellulosic ethanols, isobutanol, clean diesel and hybrid technologies. For additional information, please visit www.alms.com.